This unique, fantastic quality shed has been created with timber taken from renewable sources. It benefits from a couple of standout features including an extra thick frame for superior support and an openable single glazed window. The fact you can open the window is fantastic as it means you can provide ventilation into the building, helping to prevent moisture. It also means you can make it more comfortable to use during hot weather. As it comes with a pent roof, this shed is particularly well-suited to gardens which have low hanging branches and other height restrictions that would rule out an apex design shed. It benefits from a single ledge door which has a great hasp and staple attached. Whilst this won’t securely lock the door, it will keep it from opening when you don’t want it to. A padlock won’t cost much money and can be easily added to the hasp and staple for great security. The shed has been basecoat treated to protect it throughout the shipment process. However, you will need to apply another treatment once it has been erected, as well as annually afterwards. Overall this is a very high quality building that is ideal for storing gardening equipment and essentials. It offers great value for money it is guaranteed to last for years provided you treat it properly. Though it is base coated, the shed still requires immediate and annual treatments. If you use water treatments however, it won’t be expensive to maintain. Solid sheet floor isn’t upgradable. This won’t be a problem if storing light or medium weight tools. This is quite a small, yet high quality storage shed. It has been constructed to last and benefits from great Shiplap cladding. The pent roof gives it a space saving quality, making it suitable for assembly in areas where an apex shed wouldn’t fit. As it is a smaller shed and the floor is constructed from solid sheet materials, this wouldn’t really be good to be used as anything other than a basic storage facility. One thing we do need to point out is that the shed you receive does not match the picture shown. It comes with a natural brown finish, not green. You can paint the shed green and white as shown, but it doesn’t come that way as standard. Despite being a pent shed, this building is pretty tall. Most people will find it incredibly spacious to walk around inside. What we really like about this shed’s measurements however is the width of the door. We find a lot of sheds this size come with a 2’2” wide door. As the one on this building measures 2’7”, it offers a lot more space to add and remove tools and equipment. However, the height of the door is a little shorter than average. The majority of people will need to duck in order to enter the shed which can be inconvenient. Due to its compact size however, most of your storage will be reachable without having to actually step foot in the building so it shouldn’t cause too many problems. It has a pent roof with a very gentle sloping design. This directs rain down and away from the building, helping to prevent rot and decay. It has been built with 8mm solid sheet materials which generally provides a very reliable and stable support. A felt roof covering is supplied though we will highlight that this isn’t very thick. As it is a mineral felt, it will wear down over time and we’d estimate this particular felt will only provide reliable, tough support for around a year. So you may like to upgrade to a thicker variety. The floor also has a solid sheet material construction. Now we’re not the biggest fans of this type of floor as it doesn’t offer the most robust support. However, it is perfect for lightweight gardening equipment. As long as you don’t want to store anything significantly heavy, you will find the floor is adequate enough. 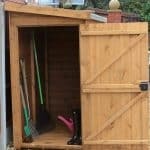 We do find it a little disappointing that Shed Store don’t offer any floor upgrade options like other manufacturers do. With Shiplap tongue and groove cladding, the exterior of the shed is built to a very high standard. There are numerous benefits that come with this style of construction, including excellent protection against the elements, added security and a more attractive design. The panels are interlocking, helping to reduce drafts and prevent rainwater from seeping through. However, its water resistance is increased further by its unique channelled design. Within each panel you’ll notice a slight indentation running throughout the centre of the timber. This works just like a drainage system, ensuring water doesn’t have the ability to cling on and damage the wood. Shiplap is also less likely to warp if exposed to high temperatures. So it doesn’t matter where you build the shed, unlike overlap clad buildings. The cladding also comes with extra protection on the off-chance the timber does warp because of seasonal changes. An expansion gap is added just like it is when you install laminate flooring. This supports any shrinkage or swelling which may occur, ensuring maximum rigidity is maintained. As well as the quality of the cladding, one thing that does impress us with the Shire Shiplap pent shed is its unique frame. Standard framing is most commonly used within this size shed which measures 28mm x 28mm. However, the interior framing of this building measures 34mm square framing. This thicker frame provides a much stronger support, giving you reassurance that the shed will remain strong and robust for many years. Though this shed does come with a base treatment, you still need to apply further treatments both after assembly and annually. Shiplap is more durable than overlap, but it isn’t totally weatherproof. The base treatment isn’t very strong and is simply there to protect the timber during transit. Treating it after you have assembled the building will ensure it does not get affected by heavy downpours or harsh sunlight. If you’re wondering which treatment to opt for, we’d recommend a spirit based variety. This doesn’t just leave a surface barrier; it also penetrates inside the timber and provides an interior barrier too. So whilst annual treatments are recommended, you could choose to apply a spirit treatment every couple of years instead. The only thing about spirit treatments is they don’t come in a wide range of colours. So if it is colour you are looking for, you might be better off applying a water treatment. These do only protect the surface of the cladding however so you should apply these ones annually. What’s really disappointing with this shed is the warranty. 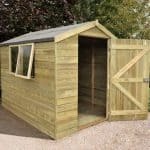 The Shed Store typically offer a 10 year anti-rot guarantee with their wooden sheds, but this one only comes with a 1 year guarantee. This is most confusing because of the Shiplap clad walls. So you can tell what sort of quality you are getting from the limited warranty supplied. The shed may come with a single door, but it is much wider than most shed doors supplied. This means you have a lot more flexibility with what you can store. 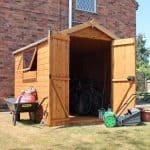 There is plenty of space to get bulky or unusual shaped equipment into the shed, without banging your elbows or trying to manoeuvre in awkward positions to fit things in. The only thing that could be an issue is the height of the door. At 5’4”, it’s pretty short which isn’t a problem at all if you are short yourself. However, if you’re six foot you may find it awkward ducking down to get to your storage. The good news is that most things can be reached from the actual doorway due to the small size of the building. We find this shed has a few surprises in terms of quality features. The Shiplap cladding is one of them and another is the single glazed window. Unlike most sheds of this size, the window can be opened to allow air to ventilate through the building. This will help to prevent the chance of moisture and ensure your equipment is dry all year round. It comes with 3mm glazing which is a little thicker than most shed windows. So this also helps with insulation during the colder months. An attached hasp and staple is attached to the door, letting you easily add a padlock. The padlock isn’t provided however so you will need to buy one in order to keep the shed secure. As well as a pad-lockable door, the Shiplap tongue and groove cladding is also going to prove troublesome for thieves to get through. However, the opening window may be a potential problem. Therefore you might want to add a more secure lock onto the window for better protection. The single glazed window also allows anybody to peer through and see what is stored in the shed. However, curtains or a blind could be added to prevent this when you aren’t using the building. It’s not overly surprising to see that there really isn’t much in the way of customisation options or extras with this shed. After all, it is built to a very high standard and already comes with some great features. However, with that said there are still things that could be improved upon. For example, though there is a hasp and staple, a padlock isn’t provided. Usually Shed Store show a number of padlocks and alarms as extras with buildings that come with a pad bolt or hasp and staple. So the fact they don’t with this one is a little puzzling. Of course, you can browse the site and find additional extras, but on the actual checkout page, you’re only shown a few related items you might find useful. These related products include a Tool-Plus rack with wheels, a Resin Shelving Storage Unit, a Chaselink Ames True Temper Sync-it Outdoor Wash Station and a Bull Picador Green Wheelbarrow. Out of these the storage unit and Tool-Plus rack are the most noteworthy. They can provide additional storage and the tool rack is particularly impressive. It is capable of holding more than 30 tools and doesn’t actually require any tools to put it together. It can be assembled in just 5 minutes and comes with a durable steel core construction. 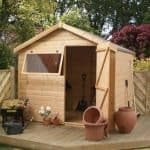 So whilst there aren’t any extras suggested on the actual product page, we would recommend browsing the site to see whether there’s anything that could improve this shed for you. Another high quality shed from the Shed Store, the Shire is constructed from strong exterior cladding. The single glazed openable window is another high quality feature and really sets it apart from the competition. The shed has a mixture of both durable and not so durable features. For example, the 12mm Shiplap cladding gives it a tough exterior which is guaranteed to last the test of time. The solid sheet flooring and poor quality roofing felt however slightly lets it down. Of course you can upgrade the roofing felt to improve its longevity, though it still requires treatments to maintain its weatherproof cladding. Although the Shiplap cladding does enable you to install shelving, potentially increasing its storage capacity, the actual size of the shed means you are only provided with a small amount of internal space. So it’s mainly recommended to those who only need to store basic tools and equipment. The Shed Store estimate this shed will take around 4 hours to assemble. Keep in mind that because a high quality, thick cladding is used, the panels will be slightly heavier than an overlap shed. However, it does come in quite a small size so this makes installation easier. Although this shed is built to last and it can be treated every other year, it still comes at a slightly higher cost than many of its competitors considering its compact size. It does provide good value for money though and its longevity alone makes the slightly higher cost worthwhile. Final Thoughts: This is one shed we are happy to recommend. Like every outdoor building it has its good points and bad points. However, its good points far outweigh the bad. Just some of its incredible features include a single glazed, openable window, hasp and staple and extra thick frame. It is constructed to really last the test of time and this is highlighted with its 12mm Shiplap tongue and groove cladding. Whilst it does require regular treatments, you are still getting very good value for money. 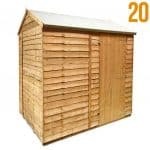 Security is one of the only bad points with this shed, though that can easily be remedied by adding a padlock which you will find as an extra offered by the Shed Store.